Happy Monday everyone, I hope you all had a fantastic weekend and I hope you have an amazing week ahead. The next two weeks are going to be particularly crazy as I work on meeting March 31 deadlines but I still plan on finding a few minutes each day to regroup and let my mind relax. Don’t ever forget the importance of a little self care, no matter how short, it can really help during stressful times. After 20 tax seasons let me tell you I have definitely learned some survival tips! For those who know me and have been following my journey you know that I have gone through a lot the last few years when it comes to my professional career. There have been a lot of ups and downs but I am finally starting to feel settled and more excited about the future than I have been in a long time. The end of this month will mark 6 months with my new Firm and while it has been challenging my passion is coming back. So on that note I decided that after busy season is over its time to get my work wardrobe back in order. For several reasons which I will talk about over this series of posts I let myself get in a rut and I shied away from being the fierce fashionista that I was known for at the office. Well enough is enough and these looks I created from Torrid will certainly help me get back to my stylish ways. The focus of this first post is looks that are what I consider “Professional”. They are perfect for a corporate environment, an office that perhaps has a stricter dress code or those times when you have a big presentation or meeting and you want to knock them dead not only with your brains but also with a killer look. I always believe that an outfit you feel good in gives you the extra boost of confidence you need to let the fabulous you that lies underneath truly shine. I also wanted to show you that there is more than one way to put together a professional look. So I am going to share a look that is Classic and one that is Modern. I personally like to have a mix of both options in my closet so I can play off how I am feeling on any given day. I also have my times when I need that classic look and others where I can have a little more fun. Ever since I started my blog I have always been so fascinated with the idea of what it means to be a professional and how that intersects with fashion and how women are judged in the work force based on how they dress. And being fat I think only heightens the issue and adds another layer of complexity to an already complicated situation. Overall, I am shocked that in 2019 women still face so much discrimination and suffocation when it comes to what they can and can’t wear to the office. Or to even go as far as to say what you wear on your personal time reflects on your professional reputation. And the sad part is that these “rules” are often determined and dictated by men. I couldn’t believe in my last position that there were rules about wearing pantyhose, what kinds of shoes you could wear, a maximum height on your heel and wearing a sleeveless shirt was a no no. I felt like I had been transported back in time. I say it’s time to take control of the situation and redefine the “rules”. A Classic professional look for me is always going to be a black suit. It’s a wardrobe staple that should be in any women’s closet. Even if you work in a more casual environment or you wear a uniform, a black suit has staying power. It’s perfect for interviews, conferences or special events. And you can easily wear the jacket or pants with other pieces in your wardrobe to maximize their use. The key for me is finding a great fit. It’s important to find a suit that is designed for your curves and works for your body type. I will also say that investing in tailoring is super important. If you need a little nip or tuck it will be worth it for that perfect fit. What I really love about Torrid’s “Studio Collection” is that it is a mix and match system. All of the pieces are made of this amazing wrinkle free stretch pointe fabric that is comfortable and stretchy but still holds its shape. There are several different styles of jackets to choose from and seven different styles of pants. It also comes in a variety of colours and there are five inseam lengths for the pants. I hope to see them expand the collection by adding a classic pencil skirt and an a-line or circle skirt midi length option. The peplum jacket and trouser pant were the perfect choice for me. I know some people are over the peplum trend but it will always be a staple in my closet because it works perfectly for my shape. I love this jacket because of its simple clean lines, the one hook and eye closure that accentuates my waist and the length. I am wearing the size 5 and it is my perfect fit. The trouser shape pant is a classic fit that skims my legs and provides a nice long line. I am wearing the size 30 with a short inseam and was so thrilled I could wear them with a flat and they didn’t need to be hemmed. I could wear a size 28 but it would be too tight on my knee because of my Lipedema. But the waist is still very secure in the 30 and doesn’t fall down. They also have a nice wide waist band. I always say that a classic look doesn’t have to be boring and when I saw this rich vibrant colbalt blue blouse I knew it was the perfect pop of colour to complete this look. Torrid has come out with a collection of blouses that have several unique styles with different silhouettes to work for different body types and different occasions. They all have their own name so if you find a style you like you can easily search for other colours and prints in the same one. This is the Harper which has a v-neck, short sleeves, a soft flowy georgette fabric, a shirt tail hem and a front placket of covered buttons that provide a polished look. I really love this style but I do wish the cut in the hips was a little more generous. This is a common issue that I can have with Torrid blouses that don’t have stretch. I had to size up to the 6 to get a proper fit. To accessorize this look I went with a simple flat also in colbalt blue, a colourful snakeskin bag that is a top trend for spring, some statement earrings to tie in the yellow from the bag and a simple bangle. I love how the punchy bold colours express my personality and make a powerful statement but the overall look is polished and timeless. For my Modern take on a professional look I decided to play on current trends and silhouettes. A long length jacket is definitely a must have trend for spring and I couldn’t resist this floral one when I saw it. I love that it is a print but not overly bold and it also incorporates Pantone’s colour of the year, Living Coral. This jacket isn’t made of the same ponte fabric that the studio collection comes in or even their signature stretch fabric which I wish it did. Because it is such a long length I think a different fabric would have been helpful. I do love that you can wear it open with the belt tied in the back or closed in front and the tie helps define your waist. I am wearing the size 6 which I knew I would need based on the silhouette. My only other wish? Please add a back vent to jackets like this, they are super helpful when sitting down. I have to be honest and say I was inspired to copy this look from the images on the website so I paired it with the skinny pant from the “Studio Collection” which I am also wearing in the size 30 with a short inseam. Skinny pants are all the rage even for work and with a longer jacket I felt more comfortable wearing this trend for the office. I did find that these ran smaller than the trouser style, particularly in the waist. The leg on these pants is perfect, they fit my knee but are still small at the ankle like they should be. And they don’t fall down because they stretch out which drives me crazy! This coral cami with the polka dots was a perfect play off of the print in the jacket. This is the Sophie swing cami silhouette, probably one of my fave Torrid blouses, I have quite a few in my closet. I love the v-neck, the swing at the hips and the adjustable straps. My only wish for this is to make the straps thicker so it was more bra friendly and if I take my jacket off at the office you wouldn’t see them. Because really who wants to wear a strapless bra to work? I am wearing the size 5. I had so much fun accessorizing this look. I love playing with pattern, prints and colours and this gave me the perfect opportunity. The black and white animal print of the shoe are also a must have trend and add that wow factor this modern look was calling for. The mint bag and earrings may seem like an unexpected choice but they are a great contrast to the coral and tie into the print on the jacket. And these earrings are such a great deal, they come in a set of 3 with peach and pink from Torrid and are only $17. Don’t forget to check out Torrid’s amazing selection of accessories. 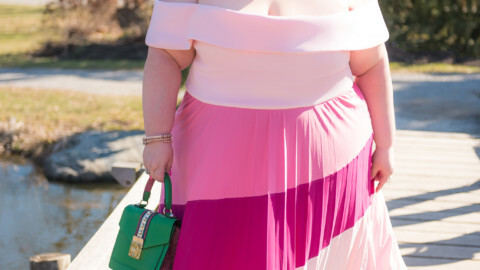 I am a ssbbw and have been struggling to find career wear. I love these looks from Torrid, but I tend to shy away from purchasing knits. I feel like they don’t last long. Regardless of how carefully I wash them, the fabric pills and the colors fade (especially anything black). Do you have any suggestions on how to keep ponte knits looking good? Is dry cleaning the only option? Hi hun! Thank you so much! I love ponte so much but you definitely need to look for high quality thicker ones. The number thing I say is don’t put them in the dryer and wash them on delicate. There is actually something in the fabric that breaks down if you put them in the dryer. This also saves the colour. And use a detergent designed for dark clothing. Hope that helps!